This tastefully furnished, cozy yet spacious home, built in 1910, has been completely updated. 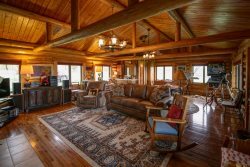 The living room is warm and inviting, with a gas fireplace and a library of art history and Montana literature. Original artwork decorates the walls. The kitchen, just off the living room and stocked with all the appliances you need, is open and great for socializing. The master bedroom, with a queen-sized bed, has an en suite bathroom and a light-filled cupola. The second bedroom has a queen-sized bed, and the third has a small bed suitable for a child or overnight guest. The third bedroom also has a nice deck overlooking the back yard. Nice neighbors and gorgeous neighborhood! Location, location, location! This home is in Cooper Park Historic District, which means a short walk to downtown shops, galleries, restaurants, the community food co-op, and Montana State University. Take a five-minute walk for an espresso or grab breakfast at one of the local restaurants. There are cross-country ski trails in town, as well as world-class trails 16 miles north of town. The largest ski resort in the country, Big Sky, is just an hour away. Bridger Bowl is another great option for skiing, just 20 minutes away. This home is also dog friendly (1 dog only please), with a doggy door in the back that opens to a fenced-in yard and deck. Cooper Park across the street is an off-leash dog park. Also, feel free to entertain guests and use the grill for a summer BBQ. Zach at Stay Montana Properties went above and beyond to help us with accommodations, check in during our stay and provided the best customer service I have ever experienced. A sweet little house with a fabulous kitchen and back yard area conveniently located to town, campus and recreation. Cute artsy house, right in town. Plenty of room, fully stocked, awesome kitchen! We stayed at Catherine's home for a week to visit our daughter in May. Catherine was so efficient and responded quickly when making the reservation. Upon arrival we entered the white picket fence and fell in love with the home immediately. Catherine was so welcoming and gave us a tour of her home, which was filled with beautiful artwork and comfortable furnishings. Her home was clean and neat. We arrived on a sunny, warm day in May and the tulips in her yard were in full bloom. Our dogs enjoyed hanging out in the private fenced-in back yard. Several days later it snowed for two days and the gas stove in the living room was a cozy addition. We all enjoyed gathering around the center island in the huge kitchen. I cooked several meals there and she had everything I needed. Her home is in a walkable community and just minutes away to the main street, where the center of Bozeman is filled with shops and dining options. We had such a wonderful time staying at Catherine's home. Her house gives us another reason to love Bozeman! This is a really nice house in a great location. We walked downtown many times during our stay (to dinner, shops, etc). The kitchen is big and awesome, so great for people who like to cook. There is a wonderful big tub upstairs for relaxing baths, and the gas stove downstairs is really nice in the winter. We were there over Christmas -- it snowed the whole time and this was the perfect warm and family-feeling place for us to call home. Would definitely stay there again and recommend highly.